Bala Chaturdashi in Nepal is held at Pashupatinath temple and at the Gujeshwari temple near Pashupatinath temple. 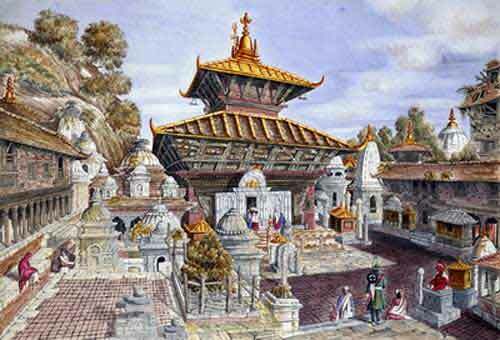 Here is the story of Bala Chaturdashi observed in Nepal. It is observed on the fourteenth day of the dark moon in November- December. Long long ago there lived a trader named Bala Nanda. One day he came to Arya Ghat, a cremation ground, to attend the last rites of one of his relative. The people set the body on fire and sat to eat the ceremonial food. Suddenly, there was a small explosion in the pyre and a small piece of flesh fell into the plate of Bala Nanda. Nobody noticed it and Bala Nanda ate the small piece of flesh. Soon Bala Nanda turned into a demon with silver head and from that day started consuming human flesh. The demon was called Balasur and he roamed Arya Ghat searching for dead bodies. Soon people stopped taking dead bodies to the ghat and approached the King of the region. The King appointed, Brisha Singh, an old friend of Balasur to kill the demon. The demon was very happy to see his old friend and invited him. Brisha Singh took advantage of friendship and killed Balasur. The King and the people were happy. But Brisha Singh could never get over the guilt and he started meditating Lord Shiva in the jungle of Shlesmantak. After a prolonged tapsya Lord Shiva appeared before him. He asked for the moksha of Balasur. Lord Shiva asked Brisha Singh to scatter seven varieties of grain on the jungle of Shlesmantak to get rid of the sin of cannibalism on Balasur. This is the legend behind Bala Chaturdashi in Nepal. Even today people scatter seven varieties of grain in honor of deceased relatives.